I hardly ever decorate for Thanksgiving. In fact last year we went to Disneyland for the holiday. But this year we are staying home and we need a few little things for our table. 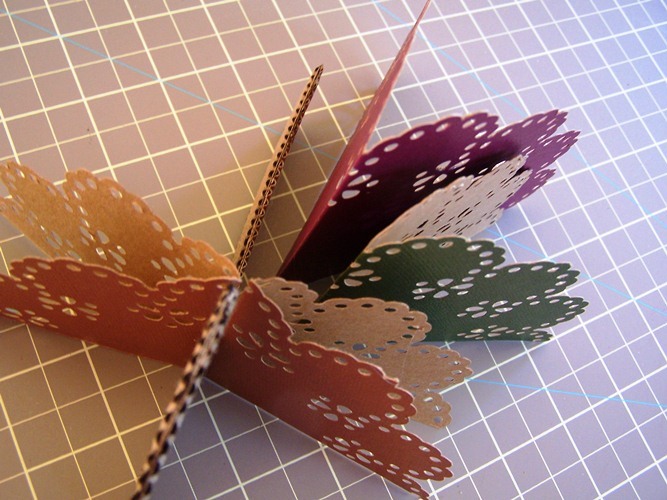 When I received my Martha Stewart Crafts Circle Edge Punch, I immediately thought the pretty edge of the circle would make pretty turkey feathers. I was trying to create a modern version of a fold out honeycomb party decorations. I happen to love they way they turned out! the two legged, gobbling, non-edible kind for Thanksgiving! 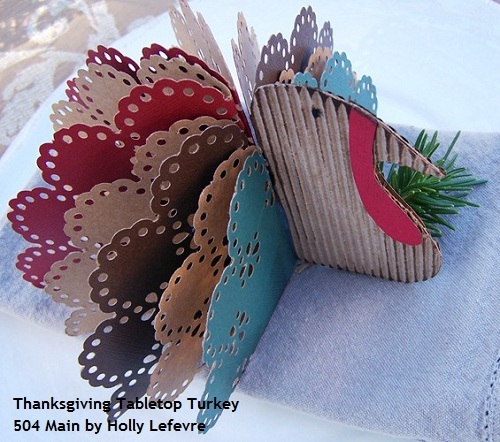 I used a fluted sheet of cardstock from Canvas Corp. You can also use paper bags, cereal boxes, chip board - let your imagination run wild! 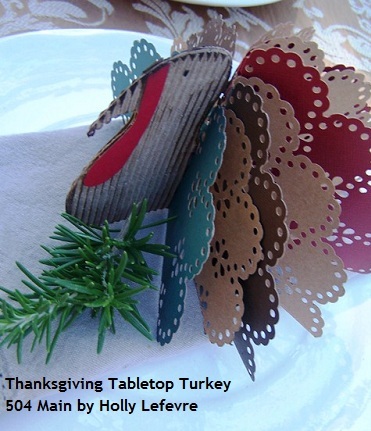 Tim Holtz Kraft Kore paper pad with "sophisticated" turkey colors. 2. 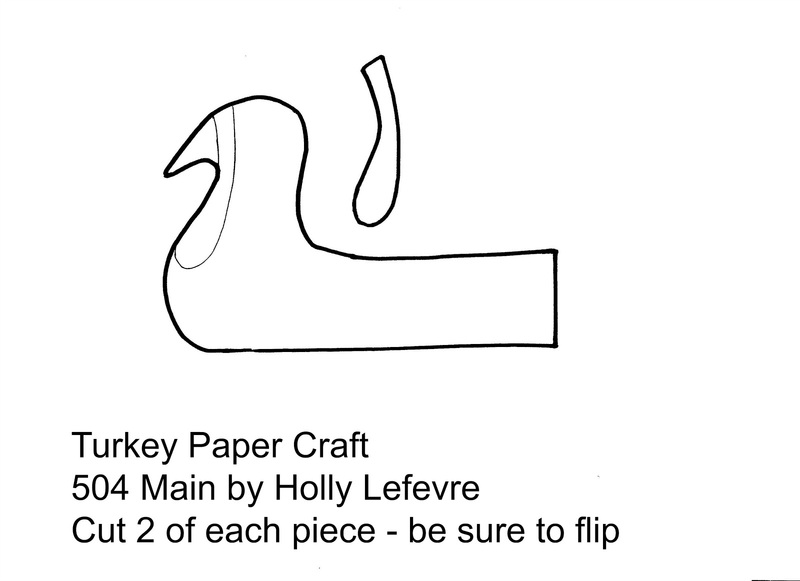 Cut out 2 turkey bodies in the fluted cardboard (NOTE: you can use any paper - I have even used the back of cereal boxes). 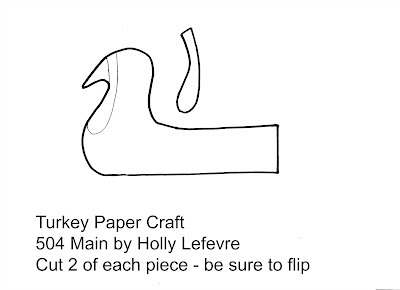 BE SURE TO FLIP THE TURKEY BODY OVER SO THAT YOU HAVE ONE OF EACH SIDE. 3. Cute out 2 waddles (I used the same red for all of the turkeys - it only takes a bit of paper). 4. 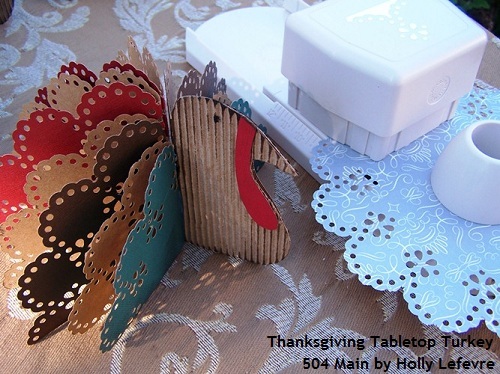 Determine your color combinations for the turkey feathers (my paper pad only had 24 sheets, so I mixed and matched). 6. 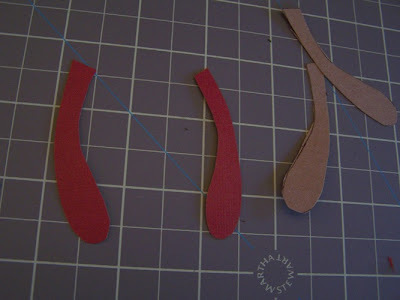 Fold the circles in half; cut the circles in half; fold the halves in half. 7. 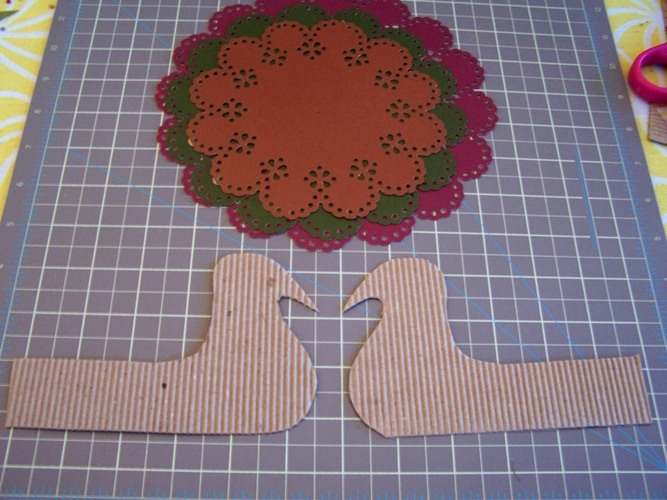 Glue the turkey bodies together using the rubber cement (or you glue of choice). 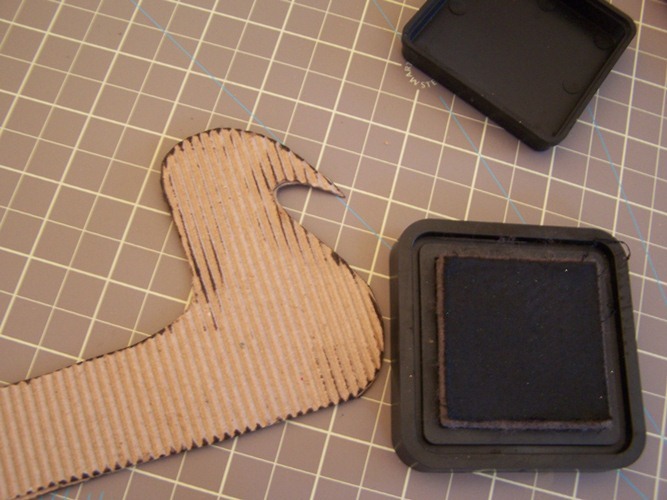 Brush rubber cement on both sides of the body and stick together for the best hold. 9. Right where the curve of the turkey neck becomes the "body" run a line of hot glue and attach the one half of the 6" circle along that line - Try to place it so that the hot glue is not visible from the front of the turkey. 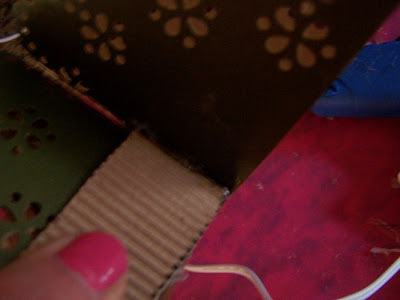 Hold in place until glue hardens. 10. Run a line of hot glue just behind the folded 6" circle. Take the half of the 7" circle and place it right up next to the fold of the 6" circle. 11. Run a line of hot glue just behind the folded 7" circle. Take the half of the 8" circle and place it right up next to the fold of the 7" circle. 12. Fan out the folds. 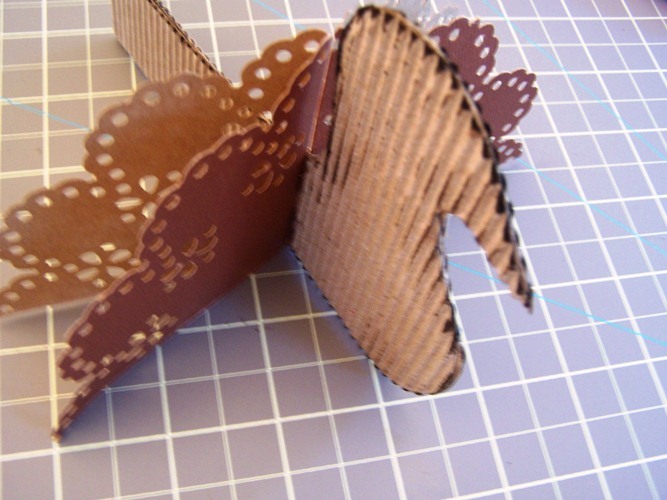 My paper was a cardstock and folded and kept its shape pretty well. 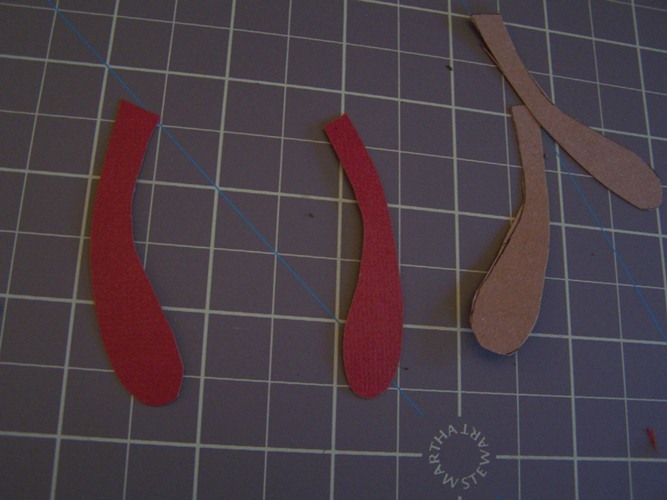 You can add more glue to keep the feathers in the order/arrangement you desire. 13. Glue the waddles on the turkeys. There you go...cute little non-edible turkeys - one for each pace setting...or better yet how about making one big one as a centerpiece - off to make one now! 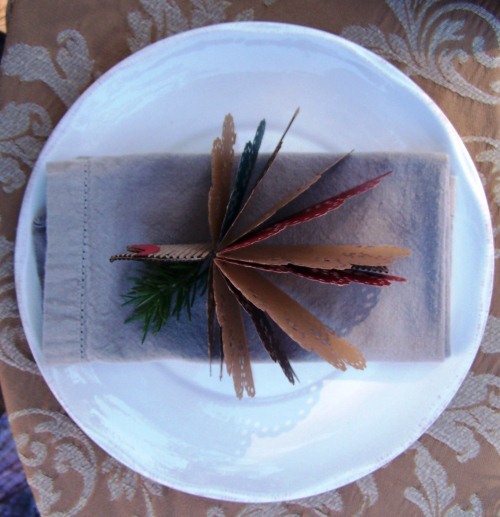 Do you have a favorite Thanksgiving table decoration? enter the Coupon Code BLOG20 at checkout. I love this turkey!! I am sure it will make a great addition to your thanksgiving decor. Great Turkey, what a fun punch! These are so cute Holly!! What a creative way to use the punch! This is so cute and clever! Thanks for showing us how you did it!! Hope to make some this weekend. Hi, Holly. These are too cute! 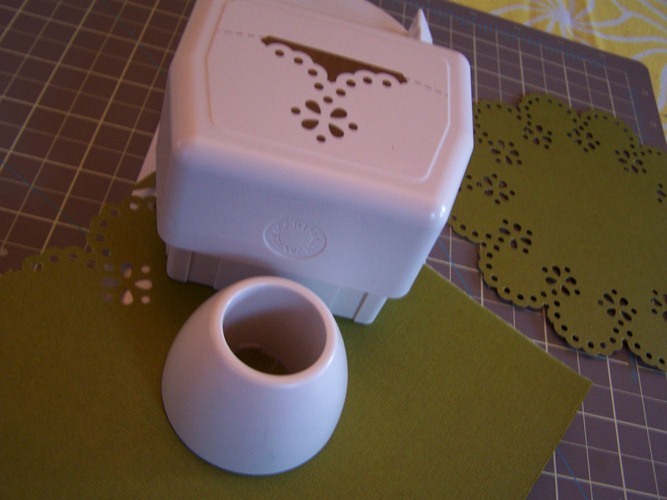 What a fun way to decorate a table... am pinning this now! Those turkeys are so stinkin' cute!! What a great way to use that punch ... you're so creative! Really cute! I just saw these today since I've been out of the loop for a while, but I will be saving this so I can make them for next year!!!!! Getting Crafty At Home for the Holidays!